AS EUROPE’s big guns flex their muscles in football’s corridors of power, the question has to be asked: How much longer can Sepp Blatter continue as the dictatorial President of FIFA. Members of the European Club Association (ECA), representing the continent’s top football clubs, have warned FIFA they are running out of patience with how football is governed on the world stage. And the buck must stop with Blatter after presiding over the shambolic decision to hand the 2022 World Cup to Qatar without resolving the fundamental question of when the tournament will be staged. The ECA have demanded a greater say in FIFA’s decisions and criticised FIFA for the confusion over speculation of a possible switch of the 2022 Finals to the winter. On Monday, FIFA president Blatter performed an apparent u-turn on his previous suggestions that the 2022 World Cup would take place in winter by saying a summer tournament in Qatar had been “settled”. In a statement, the ECA expressed its “concern on the way matters of such importance are managed by football’s world governing body” and its opposition to the “disruption” of the possibility of a winter World Cup. 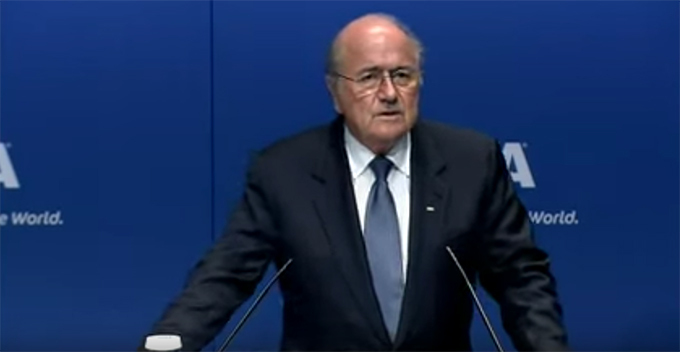 Blatter is a master politician gifted in the art of survival and, despite putting his foot in his mouth on many occasions, he has done much to promote football’s global standing. There is no doubt his passion for the game is genuine. But it is impossible to see how a dinasaur who is blatantly more sexist than Andy Gray and Richard Keys and who lacks the transparency to clean up the rumours of corruption can give FIFA the decisive leadership required in the modern world.